Pokemon Typing DS pits you against hundreds of monsters, armed only with a wireless keyboard and your touch-typing skills. With all of the news pouring out of Japan about the 3DS, it's easy to forget that Nintendo's current handheld will still be around for a little while longer. Today, the publisher unveiled a new Pokemon title for the DS and, well, it is probably the strangest entry in the series since the photography-focused Pokemon Snap. 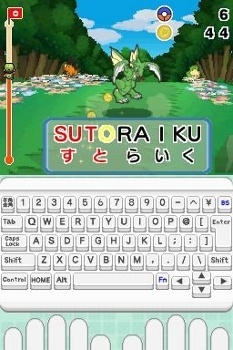 Pokemon Typing DS replaces pokeballs with a keyboard, pitting players against monsters in word-based duels. Like in previous Pokemon games, you'll take on the role of a young trainer, bobbing and weaving through caves, forests, cities, and beaches in search of every last one of those little creatures. Players will have the chance to face off against hundreds of different Pokemon, ranging from the classics like Pikachu to those new critters from the recently released Black and White games. The key difference between the standard Pokemon entries and Typing is that you won't be fighting the monsters in turn-based combat. Instead, like in the zombie-themed Dreamcast classic Typing of the Dead, you'll capture Pokemon by typing words until their health drops. The more quickly you type, the more effective your attack is. Of course, typing on the DS touchscreen can be a bit of a chore. To make your life easier, Nintendo will be packing in a wireless DS keyboard with each copy of the game. No other uses have been announced for the peripheral, but wouldn't it be wonderful if Nintendo allowed it to work with other programs on the handheld? Pokemon Typing DS will be released in Japan in early 2011. Given the pricey peripheral and the general quirkiness of the title, I wouldn't hold my breath for an overseas release. Hopefully, the thing will be fairly import-friendly, I've been craving something similar to Typing of the Dead for years.